A classic recipe provides the foundation for all sorts of variations. Like a lot of other people, when it's my turn to cook I am always looking for a quick-to-prepare one dish meal. The solution is usually a stir-fry. At the end of yet another 12-hour work day, the time or energy for multiple dishes is usually lacking. Now that our garden's scarlet runner green beans are producing, a typical stir-fry combines a handful of meat or meat substitute and a few cups of julienned green beans. Here's a standard recipe around our house in summer, from last year: What's Cooking at our House: Sichuan Green Beans (August 10, 2013). One way to experiment with some measure of certainty that the results will be edible is to modify recipes you've already tried. Since I'd recently made stir-fried scallops in Oyster sauce for guests from Yan-Kit's Classic Chinese Cookbook (original edition 1995, re-issued 2006), when I scrounged a few prawns from the freezer I reckoned I could use Yan-Kit's basic recipe as a base and add a few black beans for a bit more punch to this classic Cantonese-style recipe. Meat is typically more of a condiment in Chinese cuisine than the main ingredient, and so this small dish of prawns is served with a vegetable and rice. 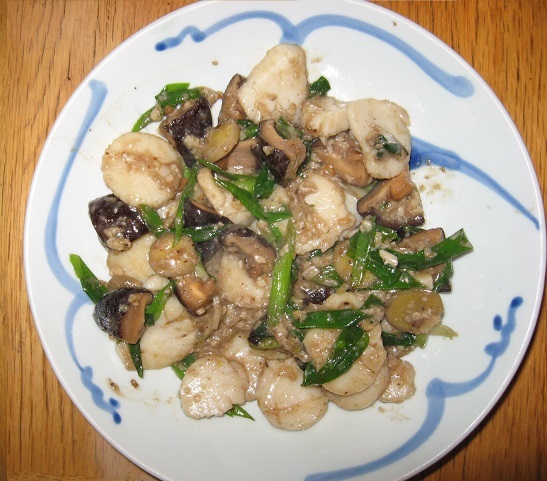 This is a recipe that substitutes snow peas for the Chinese mushrooms: Scallops With Oyster Sauce. 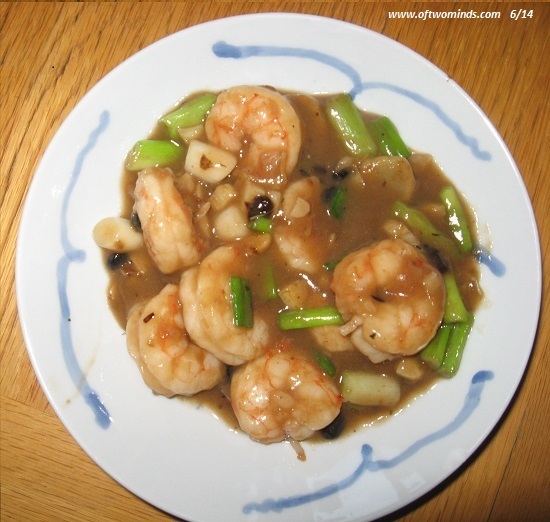 The template for this kind of stir-fry includes a marinade for the scallops/prawns (usually corn starch and Chinese cooking wine), the mushrooms, chopped ginger, garlic and scallions (green onions) that are cooked with the prawns/scallops and the ingredients for the finishing sauce that's added at the end, after the meat has cooked (both scallops and prawns cook quickly). 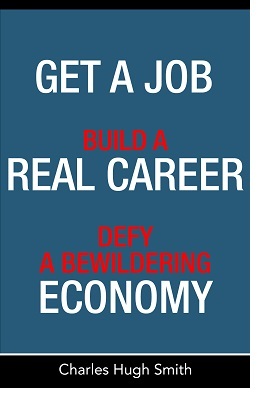 I'm not very picky, but I thought this variation turned out pretty well. A classic recipe provides the foundation for all sorts of variations, based on seasonality, what you have on hand and what's coming out of your garden (or the local farmer's market). Thank you, Ted D. ($50), for your marvelously generous contribution to this site -- I am greatly honored by your support and readership. Thank you, Marvin M. ($30), for yet another superbly generous contribution to this site -- I am greatly honored by your ongoing support and readership.